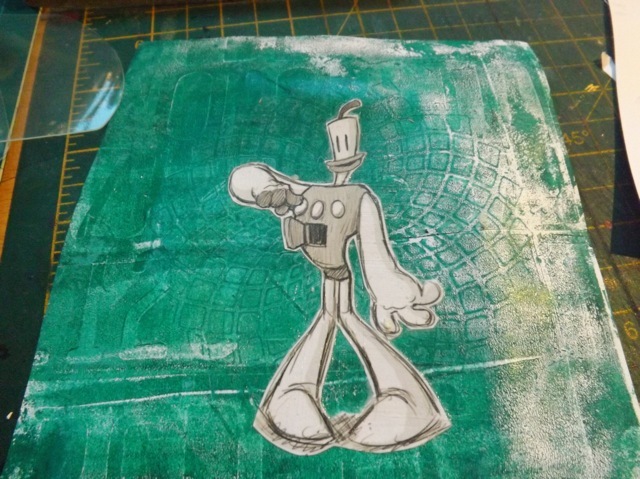 I did a little YouTube slideshow thingie with a few more samples of sealing ink jet prints with the Gelli Plate and acrylic medium. 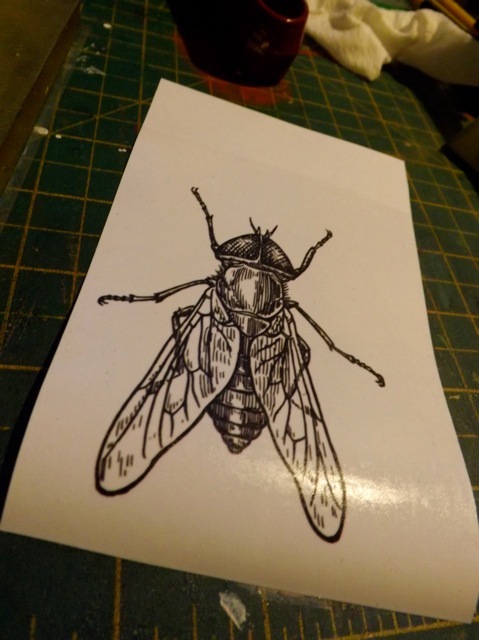 It’s such a good way to bring printed stuff to mixed media art – or at least I think it is. 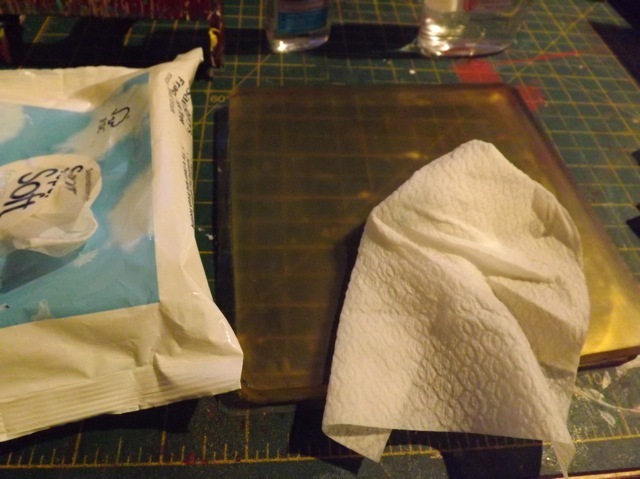 I find that a quick blast of the heat gun – or waiting till the ink jet prints are very very dry – helps a bit too. I think this will depend on what printer you have and the inks it uses. I can’t test anything other than mine, which is a Canon with compatible inks, so I would ALWAYS advise you to test it first, as I did, with throwaway pieces, to make darn SURE than they aren’t going to smear. To be fair, over a busy background a little smearing isn’t going to matter a lot, but on white or light backgrounds you could notice it more. Not sure how well this will show, but this is an image over just plain old white card. There was virtually no smear at all. Here it is coloured with Pitt brush pens and affixed to the random Gelli print background with acrylic medium – I did try a print on Deli paper, which I do NOT deem a success, as the ink did smear and sealing it kept the Deli paper from “disappearing” into the background. It’s a bit better on the lighter area than the darker but not consistent enough for me to endorse it. And finally, another image, also with Pitt Pens brushed on then smudged over the print. This one is cut out. 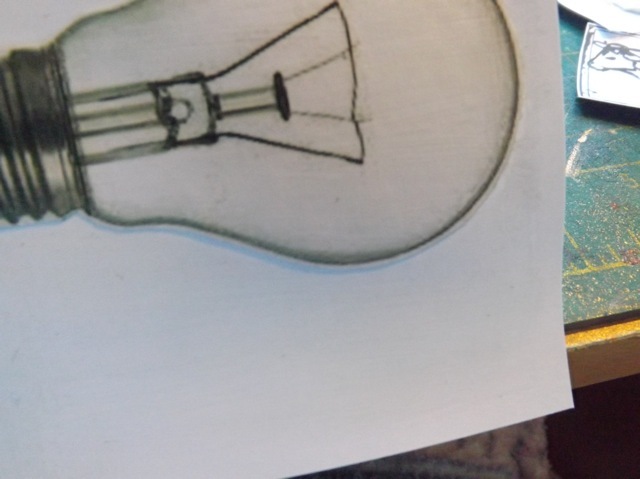 The YT thing doesn’t really have a lot more info in it, except this bit: what is important is that the plate be very clean when you brayer on the medium. Any residual paint is going to get picked up in the medium. Look at this – this plate was well cleaned with hand sanitizer. I wiped over it with a baby wipe at the end – it looks clean doesn’t it? Not one bit of colour on that wipe. 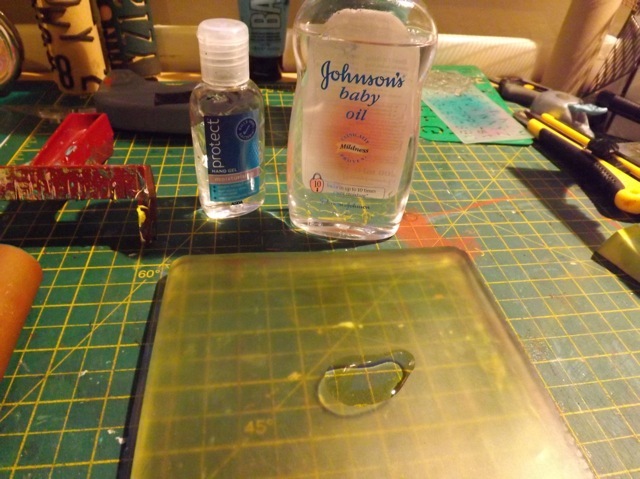 BUT if you add a few drops of Baby Oil and massage that into the plate, guess what? Yep. ALL THAT COLOUR pulled off the plate with a clean baby wipe. Once you massage i the oil and wipe it away a wipe of the plate reveals it is TRULY clean. 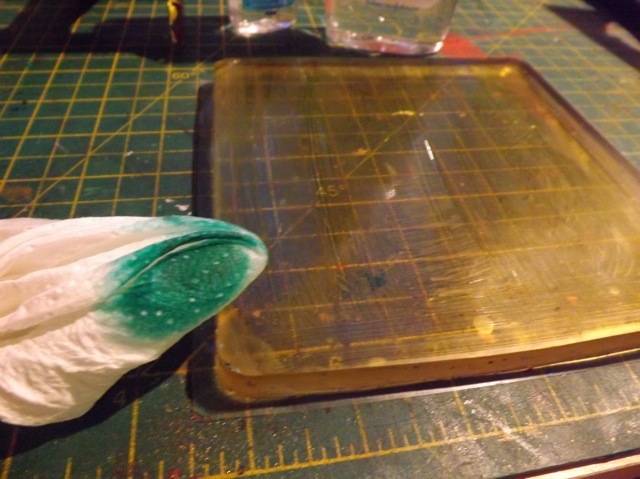 Now, I am sure I recall something on the Gelli Arts site saying you can oil the plate with mineral oil. But I also know that I have been using Baby Oil for months with no problems. 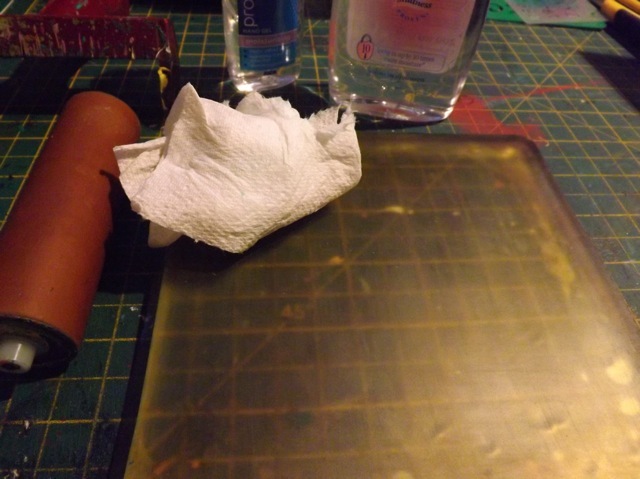 And in fact, as I have mentioned in the past, oiling it actually improves the pulling of prints – they sometimes seem to stick harder to the plate and a quick oil makes them glide off. No issue with colour change or oily residue that I can see so long as you massage it in well. But if you doubt it, don’t do it. I’m happy to risk my plate having some problem down the line but not willing to say unequivocally This is OK to do and risk yours. I’ll embed the video just in case you land here without having seen any other posts so you don’t have to hunt for it, but you wont miss much if you don’t bother to watch it! 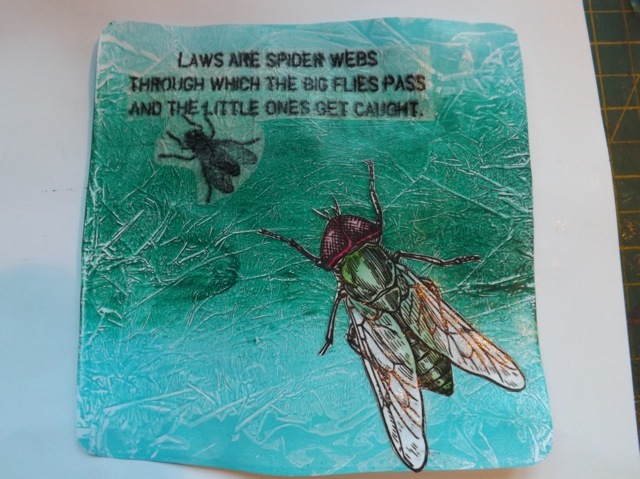 Categories: art, Gelli plate monoprints, tutorial, Uncategorized, videos | Tags: art techniques, Gelli plate, how-to | Permalink.